In my processes as an artist, I take on the role of cartographer, architect, carpenter, laborer, designer and businessman. It is the parts that make up the whole, that make up I, the artist. I was born in Royal Oak, Michigan, and raised in Grosse Pointe Farms, Michigan. Both suburbs of Detroit. My mother was a Ballet teacher and my father was an Air Force pilot. 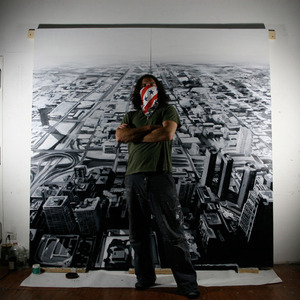 I called Chicago, Illinois, my home and studio from 2006-2012 and much of the work in my portfolio was produced here. I recently relocated my studio to the Detroit, Michigan, area, and look forward to many creative years in my hometown. My Paintings are a combination of time & place, compositional painting precision, process experimentation and viewer placement. I went to school for both Fine Arts and Architecture but since graduation I have decided to follow my own creative interests with painting. I attribute much of my architectural subject matter and interested in the Urban landscape to my Architectural schooling and try to use those ideologies in my studio practice.